Pammy Blogs Beauty: Hard Candy wants you to: Take it Off! Hard Candy wants you to: Take it Off! When it comes to makeup removal, I don't stray too often from my Holy Grail makeup remover (Neutrogena's Oil Free Eye Makeup Remover). So, it is funny that I have stumbled upon some other good alternatives to my beloved Neutrogena lately! Last month I mentioned Klorane's Soothing Eye Makeup Remover that I had discovered through Birchbox. That one is still great; but, I have found another option lately with Hard Candy's new Take it Off wipes! I know I am late to the party on makeup removal wipes! These are honestly the first ones that I have ever tried (like I mentioned, I rarely stray from my HG Neutrogena!). Now I know why makeup remover wipes are so wildly popular. It is just so darn easy to remove your makeup with a wipe! Using these wipes to remove my makeup is the first step in my nighttime beauty routine (and on days when I am so tired that I am stumbling to bed: my only step!). I just take out one wipe and gently wipe it over my eye area to remove my eye makeup first. It takes about 3 sweeps to remove the makeup on each eye. Then I find a "clean spot" on the wipe and quickly do a wipe down of the rest of my face. I really love the feel of using a wipe on my face! I feel like it gets my skin extra clean and very lightly exfoliates (no these are not an exfoliating cloth per se, but it does "feel" like I am doing a bit of manual exfoliation just by wiping). I follow up my makeup removal with washing my face and applying my moisturizer and/or treatment products. 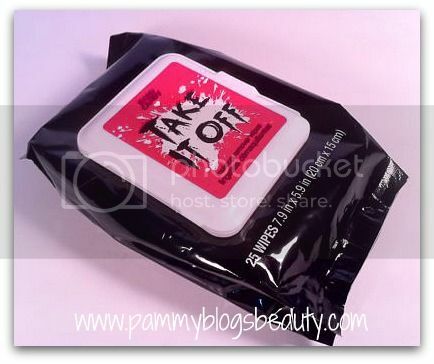 The Take it Off wipes are a new release for Hard Candy for 2012. These wipes are available at Walmart for about $5.00 for a pack of 25 wipes. The wipes themselves seem a bit on the drier side. But, with that said, I really do not have anything to compare them to as they are the first makeup remover wipe that I have tired. So, they seem dry to me in comparison to a baby wipe. The wipes are (for the most part) unscented. There is a very, very slight scent; but, honestly, it is barely detectable. Also, I like that the pack size is small. They will be super easy to travel with. 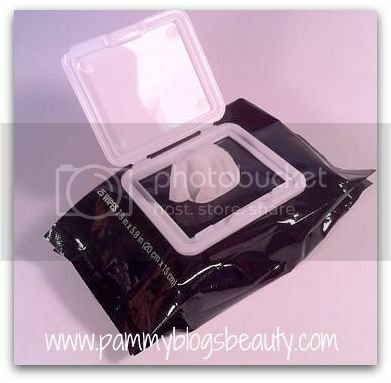 These wipes are a great option for evening makeup removal! I love how quick and easy it is to use a makeup remover wipe! Did I replace my HG Neutrogena remover? Well, no. But, I do think there is room for both a wipes remover and a liquid remover in my life! Nothing beats a wipe for quick and easy removal when I am tired. Also, wipes are better for travel as they don't fall into the "liquids" category for air-travel. What do you use to remove your makeup? Are you a wipes fan? I recently started using non alcoholic wipes to take off my makeup, when I am in a hurry I use it alone and sometimes I like to use some cleanser to loosen up my makeup and than I clean all of my makeup with wipes..I have noticed wipes work even better this way. love hard candy but never tried these wipes. i use neutrogena ones. i have to be careful with makeup wipes because some can really have a negative effects on my eyes (they have become quite sensative over the years). I may have to give these a shot though! @Niki-My eyes are pretty sensitive and these have not bothered me. :) Hope they work for you too. Hard Candy is such a great line!